The highly anticipated Rush box set "Sectors", which covers all of the band's studio and live albums during their Mercury Records years, was released last week. Rather than just a re-issuing of the albums, each one was remastered with three albums (Fly By Night, A Farewell to Kings and Signals) also receiving the 5.1 treatment. Decanter.Com, "the world’s best wine magazine", is reporting that Geddy Lee has had a wine scholarship created in his name. The honour has been conferred on the Rush vocalist and bass guitarist by his fellow directors at the charitable foundation Grapes for Humanity. The board voted unanimously to create a scholarship in his name, in perpetuity, for a student of winemaking at Niagara College in Niagara-on-the-Lake, Ontario. To establish the scholarship Grapes for Humanity Canada has committed $26,500, which will be matched by the Ontario provincial government. The income will be used to provide an annual scholarship for a student in the second year of Niagara College’s Wine and Viticulture Technician programme who intends to pursue a career path in winemaking after graduation. To read the entire article, please click HERE. Sonic Reality, the organization behind last year's release of Neil Peart Drums Vol. 1: The Kit, a sample library featuring recordings of Neil utilizing the digitized sound of the Snakes and Arrows Custom DW Drum Kit, has now put together a unique project where musicians from around the globe play classic rock covers and originals songs using the library samples. One of the covers is Rush's classic Red Barchetta which is sung by the lead singer of another popular Canadian Power Trio; Triumph's Rik Emmett. In addition to Rik on vocals as well as lead guitar, the cover of Red Barchetta also includes Sonic Reality's CEO Dave Kerzner on keyboards and Matt Dorsey on bass. Furhter, Sonic Reality is preparing a video of the song which will include Neil Peart on drums. For more information, click HERE or check them out on Facebook. Rolling Stone magazine recently assembled a panel of top guitarists and other experts to rank their favorites guitarists while explaining what separates the legends from everyone else. Not only was Alex Lifeson among the panel of those casting their votes, he also made the list, coming in at position #98 (yes, he should have placed significantly higher, but that goes without saying): Even if he had never progressed beyond the brain-rattling riffing of "2112" and "Xanadu," Rush's guitarist would have left his mark on Metallica and other like-minded metalheads. But he went on to fill out Rush's power-trio sound with a seamless mix of lush arpeggios and rock crunch that sounded like at least two players at once. "The guitar just had to make a broader statement," he says. Alex Lifeson reserves his most daring playing for his solos – just try wrapping your head around the extra­terrestrial lunacy of "Freewill." Tidings, Canada’s only national food and wine publication, has published an interview/article with Geddy Lee where the discussion centers around Geddy's love of wine, the band's recent involvement in the Grapes of Humanity Charity and more. Tidings: One thing I’ve noticed is that, given your love of wine and Alex’s love of wine, I don’t notice any wine references in your songs. Since Neil is the lyricist, can I assume that he’s not a wine buff? Lee: He loves wine and he loves food. He’s not as mental as I am, but he’s always happy to come out and eat and drink with us. He also loves to cook. But he’s got so many interests I don’t know if he would have room to become a serious wine nut. Click HERE to read the entire article. Earlier this morning, Alex Lifeson (on location in Toronto) spoke with Darren Redick of UK internet radio station Planet Rock. We spoke to Alex in the studio where he and his Rush bandmates are currently recording their brand new studio album, Clockwork Angels. The guitarist also gives an insight into how the new album will sound, revealing that the songs are starting to take an epic shape. The 10-minute long interview is now online and can be listened to via this LINK. Ed from RushIsABand posted some bullet points from the interview (courtesy of reader Distant Early Warning: &bullet; Currently in the studio in Toronto putting in long hours. The November 24th issue of Rolling Stone magazine contains a short article on Rush and their upcoming Clockwork Angels album. The issue also contains a large advertisement for the Time Machine 2011: Live in Cleveland CD/DVD. Scans of both the article and advertisement can be viewed by clicking the thumbnail images to the right. Here's a transcription of the article itself: Rush spent the past two years looking back - performing their 1981 classic Moving Pictures in its entirety. But at the same time, the Canadian prog heroes started cranking on thier 20th LP, Clockwork Angels. "We're almost finished writing," says frontman Geddy Lee. "Hopefully we'll have all of the recording done before Christmas." In connection with the release of Rush's live CD/DVD Time Machine 2011: Live in Cleveland, Neil Peart has written an exclusive article for Cleveland's Plain Dealer newspaper. Neil looks back at the band's first concert in Cleveland back in 1974, his time cycling and riding between shows and the band's decision to film the Cleveland show for their official live release from their Time Machine Tour. The band had decided to film the show in Cleveland for a few reasons. In past years, we had released concert videos from shows in Toronto, Montreal, Rio de Janeiro, Frankfurt and Rotterdam, but we had never filmed a concert in the United States. We decided to rectify that. The wait is finally over. Rush's latest concert film - Time Machine 2011: Live in Cleveland is now available on DVD, Blu-Ray and CD. In addition, a vinyl edition of Moving Pictures Live also taken from the April 15th Cleveland show, is available (though quantities are limited). As expected, the Blu-Ray version of the concert film is currently only available at Best Buy as well as the Rush Backstage Club. The Blu-Ray version will be released world-wide to all retailers on or about December 20th. Neil Peart is one of 42 names added to St. Catharines' list of "Significant Local Individuals". Neil, who grew up in Port Dalhousie, Ontario which is now part of St. Catharines, was added to the list where local developers & the town's council can draw on to name new streets & parks. According to an article at Newstalk 610 CKTB: "...The list has been going through an update for about 2 years. It's the first time the list has been changed since it was first drafted in 1999. Councillor Mat Siscoe who represents council on the heritage committee tells 610 CKTB News deciding who was on the list & who was left off was a painstaking process. Alex Lifeson was the guest on Toronto's Humble and Fred's morning show this morning. In the half-hour long interview, Alex discussed numerous topics including touring, Rush: Beyond the Lighted Stage, his love of golf, Rush's growing popularity and the band's recording progress on Clockwork Angels. According to Alex, the band is about "...a week ahead of schedule..."
The interview is available online via an audio stream at this LINK. The interview can also be downloaded as an MP3 via this LINK. Alex's interview begins around the 35 minute mark. Thanks to reader RushFanForever for alerting us to the interview and Ed from RushIsABand for the interview links. Ace Frehley Talks Rush In His New Autobiography "No Regrets"
The new autobiography from KISS's lead guitarist Ace Frehley titled No Regrets includes a humorous story and photo about the times when Rush and KISS were on the road together touring. From the book: Ace Frehley of KISS fame has published a new biography titled No Regrets. The book, which hit store shelves on Monday, includes the following story and accompanying photo: "I have so many road stories, but one that always comes to mind is the tour we did in the summer of 1975 with Rush opening for us. I always liked Rush (and still do). After a few weeks on tour I started to get to know the guys in the band, and their very funny tour manager, Howie. One thing led to another and before long Peter and I were getting visits from the Rush boys. Ultimate Classic Rock and Universal Music Enterprises are currently sponsoring a contest where one lucky winner will receive a Rush ‘Moving Pictures’ Lithograph. The contest is being held in connection with the upcoming release of Rush's Sectors box set. 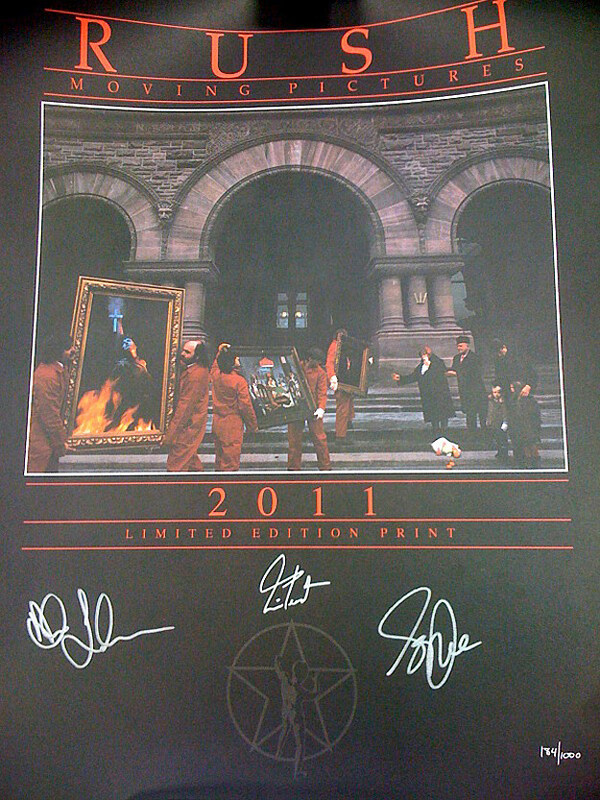 The lithograph features the classic ‘Moving Pictures’ album cover autographed by Geddy Lee, Alex Lifeson and Neil Peart. Click HERE for a larger image of the lithograph. Update: The complete transcription has been removed in place of a small excerpt, with ordering instructions for the issue. Apologies for any inconvenience. We hope to have the complete article back online in the future. Thanks. Last month we let you know that Neil Peart would be the cover-story feature in the December 2011 issue of Modern Drummer Magazine. The issue hit the newsstands earlier this week and now the entire article with photos can be viewed online.